Darlington NGS water discharge diffuser. Source: CNSC. Early designs of nuclear power plants gave rise to concerns about their effects on water ecosystems. These concerns centred on water-intake systems that could trap fish, and on coolant water leaving the plant while still too hot for aquatic life. While it is true that water intake and cooling systems of shoreline power plants could affect aquatic life, water-intake systems are now normally located deep enough to minimize effects on fish, and shaped to avoid fish entrapment. 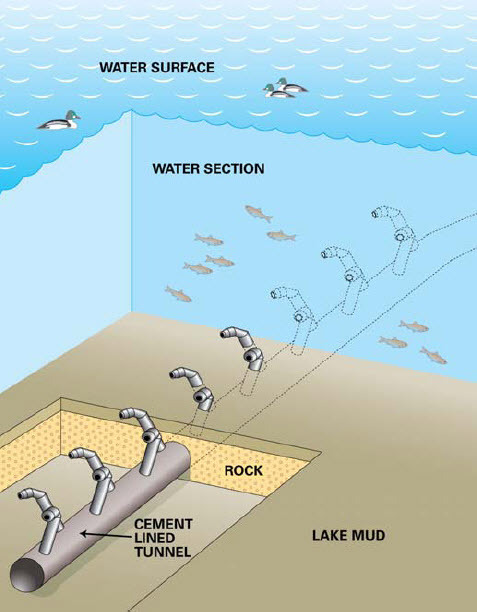 Designs of water-discharge systems have been modified to help cool the water before it is returned to the lake, and the systems are located to reduce effects on aquatic life. For the amount of power produced, nuclear plants occupy less land area than virtually any other form of power generation. For example, a pair of new nuclear reactors in Ontario, if built, would only occupy about 40 hectares of land, yet could produce some 1800 megawatts of power (or about 0.022 ha/MW). In comparison, according to the Union of Concerned Scientists, hydroelectric dams flood at least ten times this area per megawatt, massively transforming river systems. And, though wind farms do not necessarily affect shorelines, according to the US Department of Energy’s National Renewable Energy Laboratory, they require very large land areas relative to the power produced – on the order of one-third of a hectare per megawatt. It would take an area the size of Nova Scotia to hold all the mining operations and nuclear power plants needed to supply the entire world’s electricity demand. For the same amount of energy, an area the size of Alberta would have to be covered with solar panels, or an area the size of Quebec with wind farms. As in any large project, road access and construction processes can affect both land and shorelines, but these effects have been managed in Canada through environmental standards being applied in transport and construction industries.